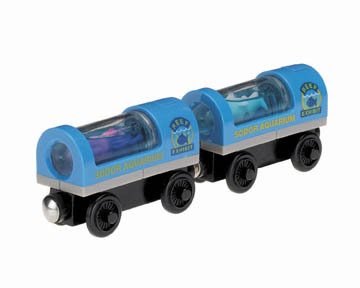 The Aquarium cars 2-pk features cars that light up the water when a button is pressed! Also includes new, exclusive creatures - Hammerhead Shark in one and a Squid in the other. Transport sea creatures to the aquarium! Cargo cars connect to other Wooden Railway engines and vehicles with magnet connectors. Perfect for Thomas & Friends™ Wooden Railway sets! Includes 2 “AG13” (LR44) Batteries.